There are approximately one sextillion planets in the known universe. That's a number one with 21 zeroes behind it. Ball-parking it. So what are the odds that two science-fiction shows would end up on the same rock? Well, it's far more likely than you think. In fact, it happened. Chalk up the coincidence to Hollywood recycling. In the fall of 1979, Buck Rogers traveled to the Aldebaran II spaceport in an episode titled "The Plot to Kill a City." It was an arid, mountainous planet covered with some inhabited domes and warehouse-like buildings. Just a few episodes later, a month after that story aired, Buck Rogers in the 25th Century took our hero to the "Planet of the Amazon Women." In that adventure, Buck rockets to a spaceport on a colony called Zantia. It might have looked rather familiar to fans watching at home. 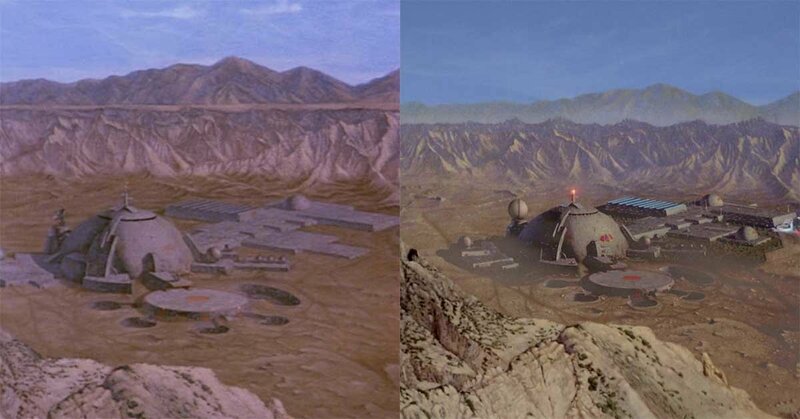 They used the same exact matte painting for Aldebaran II and Zantia. That alone would be interesting enough, even if the same location did not turn up a decade later in an entirely different universe. Early in the run of Star Trek: The Next Generation, in just the nineteenth episode overall, "Coming of Age," young Wesley Crusher faces the Starfleet Academy entrance exam on Relva VII. And the surface of Relva VII is that same painting seen on Buck Rogers in the 25th Century. Well, the place has been renovated a touch since we last saw it. A bright red beacon light flashes from a spire atop the large dome. One of the hangars has a fresh coat of paint on the roof. So how did this happen? How did Buck Rogers and the Enterprise end up on the same planetscape? The answer is Dan Curry, the visual effects supervisor for Star Trek: The Next Generation. His first job in the industry was working as a matte painter for Universal, where he worked on both Battlestar Galactica and Buck Rogers. It was a meaningful painting to the effects guru, according to the bonus content on the season-six DVD collection for Star Trek: The Next Generation. The artwork ended up hanging in his house.